The taxi picked us up promptly at 2pm and we were whisked off to our African Adventure with the Humber Valley "Intrepids". At the airport we gathered and began socializing in the departure lounge. The flight to Amsterdam was smooth, though many of us didn't sleep. After a few hours and a brisk walk around the airport we boarded the 11-hour flight to Cape Town, SA. 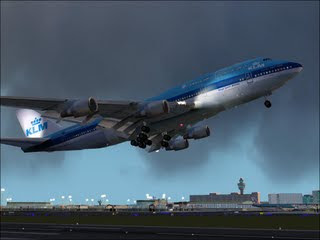 We certainly would fly KLM again - we were so well treated on both flights. And most of us even enjoyed the food! Upon arrival in Cape Town we were met by our guide, Frank and his assistant and driver Massoud. The bus in roomy and comfortable so we'll travel in comfort. Then to the magnificent Mount Nelson Hotel, at the foot of Table Mountain. We had a drink in the bar and turned in, under luxurious linens at about 1:30 am. The rooms are gorgeous and very spacious. We had a 7am wake-up call and coffee delivered to the room. A great luxury to begin our first day in Africa. We met M.E. and Dave for a brisk walk to the waterfront, then back to the hotel for a great buffet breakfast with the whole Intrepid gang. We all met Frank, our guide, in the lobby at 10 and headed out. First stop -picking up SA (rand) money - with a side trip for some "retail therapy" in one of the shops on the Victoria and Alfred waterfront. The bus took us up the mountain to the cable car base, where we climbed aboard and rode to the top of Table Mountain. The vista was spectacular!! The cable car does full rotations as it goes up and down, so everyone gets the full effect of looking over Cape Town and into the cliff. Unfortunately it all disappeared when we got to the top - it had misted over (the "tablecloth" was on the Table Mountain. ). From there we did a run to Signal Hill where we enjoyed watching guinea fowl for a bit, then walked along the brow of the hill admiring Cape Town spread out below. A general tour of the city followed , the highlight of which was a saunter through the Malay Community, a neighbourhood of brightly-coloured 250 year old homes and buildings that looked like they would fit into Miami's Art Deco area seamlessly. We were back at the Mount Nelson Hotel in time for a scrumptious "High Tea". We took over most of the enclosed veranda and enjoyed great food and conversation. By then many of us were ready to have some quiet time - seems we didn't quite get our batteries fully charged on less than a night's sleep last night. At 6pm we reassembled in the McNaughts' room ( it's the biggest after all ) for our first Hall Party. Everyone brought snacks and drinks and we had a couple of hours of music and conversation. We're getting know each other better and better. We all agree that we are very fortunate to have Frank as our guide and that we're having a great time. Some folks went for a bar dinner afterwards, but we decided that after tea and the hall party nibbles we didn't need another meal. This was certainly a full day. We boarded the bus at 9:30 for our journey to the Cape of Good Hope. (We had already had our morning walk in the rain). We saw many kinds of landscape along the way, as well as ocean vistas. We stopped in the late morning for a brief shopping break at a small fishing village. There was a lively market where we bought a couple of small "tin montage" paintings and I fed a seal a couple of fish. This seal was adopted by a local guy when it was a pup and it swims free every night, returning each day for the cushy life as a tourist attraction. We continued towards the Cape of G.H., passing through the Constantia wine area, home of the rich and famous and the source of many fine wines including "Two Oceans". As the surroundings became more wild, we began to see signs warning of baboons and that we must not feed them. Eventually, sure enough, we saw several of them cavorting on a hillside so we stopped to get some photos. They were being watched by a "baboon monitor". We also saw many ostriches roaming free on the hills and along the edge of the ocean. The Cape of Good Hope itself is a relatively small finger of land where the Atlantic currents meet those of the Indian Ocean. We did not climb to the top of the cape hill, but saw the waves crashing and rolling around the point. We then proceeded to Cape Point, where there is a high lighthouse and amazing views down onto the Cape and surrounding oceans. We had lunch at the base of the path and Larry lost part of his sandwich to an attacking starling who grabbed it on a "flypass". We climbed about 3/4 of the way to the lighthouse but decided that was our limit, especially since we needed to board the bus on time. It was an amazing area, dramatic and beautiful. 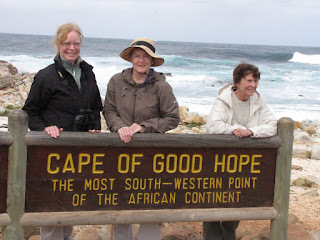 And who knew, when we studied the Cape of Good Hope in history and geography, that one day we would stand there? Our trip continued with a visit to the Penguin Colony at Boulder, where we saw African penguins up close and got some great photos. They are certainly cute little guys. On the drive back to Cape Town we passed an area of the bay where great white sharks are common. We saw non of them, but did spot whales in two different places. Frank gave us a brief rundown on on South African history and a description of the activities tomorrow. In the evening 12 of us walked a few blocks to the "Ocean Basket" restaurant - what a great experience that was!! Our "waitron" was Oscar, a born entertainer andvery helpful person. He explained all the options and described all the unfamiliar kinds of fish. We all thoroughly enjoyed the meal to the extent that Oscar brought out the chef for our applause. And the cost was surprisingly modest. Just lovely!! Slideshow of the day below. We were disappointed to learn at breakfast that we would not be able to go to Robben Island because of high waves. Frank made a few calls, though, and soon we were on our way to the Street Wire Project. It is a small enterprise in which unemployed people are taught the skills to create artwork from beads and wire. They'll make anything on special order and they have clients all over the world. We all shopped in the retail area. From there we drove to Kirstenbosch Gardens. It's a wonderfully peaceful, beautiful place. We particularly enjoyed seeing the "Fynbos" area -- the native species of plants. Like so many other parts of the world, South Africa is trying to cope with invasive species that drive out the native plants. These hardy natives hold ou the best hope of reclaiming the area. Plus -- good shopping in the gift shop. We continued on to the V&A Waterfront where we dispersed to find lunch. Then 8 of us continued to the District 6 Museum, where we learned about the effects of Apartheid policies that dictated separate residential areas for different racial groups and forced relocations. There were tears as we realized what it had meant for the families and individuals who had lived in this vibrant, diverse community just over 20 years ago. From there we walked to the Jewish History Museum, which was fascinating in a rather different way -- and quite beautiful. It depicts the history of the Jewish community in South Africa. We walked back to the hotel through the Company's Garden. The evening activity was dinner at the South African Gold Museum. It began with a tour of the museum's collection of gold artifacts (with a glass of bubbly) and continued with a "tapas" style African dinner in the courtyard. There was wonderful music, singing and dancing to entertain us while we ate. Afterward we had a drink with M-E and Dave to finish off the evening. Click for larger view with Captions. After a brisk morning walk, with just a bit of r4ain and breakfast, we boarded the bus and went to the docks. The crossing to Robbin Island was a bit rough but we all handled it well. We were met by a former prisoner, who gave us a tour of the prison area. He told of the many deprivations suffered by the political and criminal prisoners there over the years, particularly during the apartheid period. Blacks were treated especially badly. He also told us of the "each one, teach one" system the political prisoners had adopted to improve the level of education among prisoners, many of whom had little or no education. Eventually it was possible for many of them to obtain university degrees. We saw Nelson Mandela's cell, where he lived for 18 years before being moved to another prison. Then we boarded a bus and were driven around the island seeing the old church, lepers' cemetery, WWII buildings and defences, and native flora (arum lilies, fynbos ) and fauna ( African penguins, birds ). 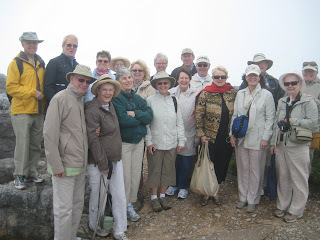 Back in Cape Town we dispersed for lunch and a restful afternoon. Our evening meal was at the lovely Baia Restauant in the V&A Waterfront area. It was sumptuous meal and the waiters were attentive and friendly. Some other Canadians who were eating there stopped by for a chat and commented on how much fun we seemed to be having. We thought our waiter ( or waitron as they are known here ) looked like a younger Barak Obama ( you be the judge - Larry posted his picture ). We enjoyed a last breakfast at the Mount Nelson ("the Nellie") and bade farewell to Cape Town shortly after. First stop - a grocery store where we all bought bags of food - milk, bread, apples, juice, baby formula, cereal and so on. Frank had suggested an outreach project to us and we were eager to get onto it - Rosie's Place - an Orphanage. Mansur drove us to and around the area of Cape Flats known as Khayelitsha. Frank explained that this is one of the many areas where shantytowns sprang up in the wake of the lifting of the apartheid laws. Thousands of people have been living in corrugated iron shacks for as much as 20 years. Recently, a program has been put in place to build nice, snug, attractive houses on the same space so people have decent housing and stay in their established neighbourhoods. We drove through several streets and children waved and ran beside us -- with no expectation that we would toss them money or candy, simply for the fun of it. We were concerned that we'd be seen as interlopers or gawkers, but Frank assured us that was not the case and everyone seemed friendly. It was clearly a lively, well-functioning community, with markets, schools, clinics and so on. But poor, very poor, In the midst of all this was our goal - Rosie's Place. Rosie told us the story of how 9 years ago, as an unemployed single mom she came home one day to find a baby abandoned on her door step. She tried to find its family without success, and planned to hand it over to social services. Before she could do so, another child was dropped to her. She drove to the town where she could leave them but was stopped by a clear voice saying "TAKE CARE OF THESE CHILDREN". Her response was "Lord you'll have to provide because I don't have the means to feed my own child". Soon, in her small home she was caring for more than 60 children. Now she runs an orphanage for up to 200 kids. They even have a drop-off place for babies, because so many were victims of murder or attempted murder. ( some arrive damaged for that reason ). Many are AIDS orphans and some HIV-positive. When we carried in our groceries, Rosie said "This is wonderful - I didn't have enough bread today for the children and didn't know how I would feed them. The kids seemed pretty ordinary - they were playing the usual kinds of games. It was lunch time and in one area about 20 or 25 babies under 3 were eating sitting on the floor. ( see photos ). They all watched us, some warily and some with broad smiles. I asked if I could pick one up, and it was clear she wasn't used to being held - so many children, too few arms to hug them. But she seemed OK with me, so I cuddled her until we had to go. When I put her down she cried and it nearly broke my heart. Rosie also has a hospice for TB and AIDS patients, and also a soup kitchen. At the end of our visit, we sang our traditional "Go Now in Peace" and a group of the kids sang the South African national anthem and a hymn for us. Many of us had tears. We do hope we can help Rosie continue her important mission. She has started an expansion to house more children, and needs about another $100,000 Canadian to complete it. We would love to help her reach that goal. As long as you live in this house you will follow the rules. When you have your own house you can make you own rules. In this house we do not have a democracy. I did not campaign to be your parent. You did not vote for me. We are parent and child by the grace of God, and I accept that privilege and awesome responsibility. In accepting it I have an obligation to perform the role of a parent. I am not your pal. Our ages are too different. We can share many things but we are not pals. I am your parent. This is 100 times more than what a pal is. I am also your friend, but we are on entirely different levels. You will do, in this house what I say, and while you may ask questions, you may not question my authority!!! Please Remember!! that whatever I ask you to do is motivated by love. This will be hard for you to understand until you have a child of you own. Until then, Trust Me. We drove on to Stellenbosch, and the Lanzerac Winery, where we are staying. We had a brief wine tasting. The generous buffet lunch made us feel quite guilty about Rosie's situation. After a late lunch we relaxed and walked around the grounds until time for a hall party and the bus ride to another winery for dinner. It was fun, with samples of beer and wine. Unfortunately when we boarded the bus to go back, it was mired in the mud. After more than an hour of attempts to unstick it, we were shuttled home by the folks from the restaurant/winery, in their own cars. Just to add to the evening's complexity, there was a police roadblock. Our driver told them to expect to see here a few more times as she planned to bring more loads of stranded Canadian tourists. She said these are license checks, as so many unlicensed drivers are on the roads, driving hazardously. Meanwhile, several of us had seen Mansur in conversation with a woman who seemed to be touching him and pawing at him Turned out she was a drunken German tourist. When he held her off and tried to leave, she bit his arm! We all felt terrible not to have somehow intervened. Poor guy! What a way to spend Eid! The good news this morning was that Frank and Mansur had successfully extricated the bus from the mud and were ready for another day. We all had a leisurely morning around the area before we gathered at noon for the day's activities. We drove through the lovely Stellenbosch area to the Moreson Winery. We enjoyed a delicious lunch at the outdoor restaurant followed by a winery tour and tasting. It was all excellent. Next was some "retail therapy" at the town of Stellenbosch, where we could also see the imposing Dutch Reform Church which dominates ( what else? ) Church St.
Next stop was Spier, where we visited the Cheetah Outreach Program and met a couple of cheetahs up close and personal. They are an endangered species and the program involves training dogs to protect herd animals by scaring off the cheetahs, so farmers won't destroy the cheetahs. We had another wine-tasting at the Spier Wine Estate, before moving into the Moyo Restaurant for a very African dinner. We ate in a large tent and chose from a vast array of food, laid out on a 25 metre-long buffet. It was very outdoorsy and we wrapped in blankets under patio heaters. There was a short entertainment of African music. We all had our faces painted with tribal markings, which actually didn't show up well on our pale faces. Then back to prepare for a very early morning departure ( 4am up depart 5am ).